During its first half Wilde recounts their previous relationship and extravagant lifestyle which eventually led to Wilde's conviction and imprisonment for gross indecency. He indicts both Lord Alfred's vanity and his own weakness in acceding to those wishes. In the second half, Wilde charts his spiritual development in prison and identification with Jesus Christ, whom he characterises as a romantic, individualist artist. The letter began "Dear Bosie" and ended "Your Affectionate Friend." Wilde wrote the letter between January and March 1897, close to the end of his imprisonment. Contact had lapsed between Douglas and Wilde and the latter had suffered from his close supervision, physical labour and emotional isolation. Nelson, the new prison governor, thought that writing might be more cathartic than prison labour. He was not allowed to send the long letter which he was allowed to write "for medicinal purposes"; each page was taken away when completed, and only at the end could he read it over and make revisions. Nelson gave the long letter to him on his release on 18 May 1897. Wilde entrusted the manuscript to the journalist Robert Ross (an ex-lover, and rival to "Bosie"). 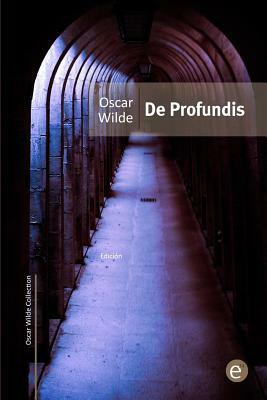 Ross published the letter in 1905, five years after Wilde's death, giving it the title "De Profundis" from Psalm 130. It was an incomplete version, excised of its autobiographical elements and references to the Queensberry family; various editions gave more text until in 1962 the complete and correct version appeared in a volume of Wilde's letters.